The Baudelaire Song Project researches and brings together for the first time all the song settings ever of Baudelaire’s poetry, looking at classical music and popular music settings, in French original and in translation, with music scores and in audio format. Hosted by The University of Birmingham (UK) with HRI Digital at The University of Sheffield (UK), it is generously funded by the Arts and Humanities Research Council (AHRC) from 2015-2019. Working with HRI Digital, it will generate a major new dataset to enable cross-analysis and visualisation of key findings. You can hear more about the project from the director Prof. Helen Abbott and research associate Dr Caroline Ardrey in a 30-min podcast hosted by James O’Sullivan at Cultural Mechanics. 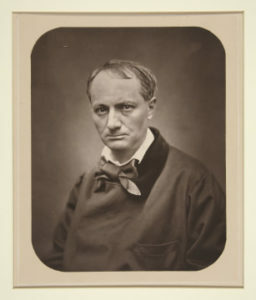 French poet Charles Baudelaire is known across the globe for the intoxicating headiness and rich imagery of his poetry. Born in Paris in 1821 where he also died in 1867 aged just 46, Baudelaire first published his famous collection of verse poems Les Fleurs du Mal in 1857. He was taken to court by the French prosecutor and after the trial was fined for offences against public morality, and 6 of his poems were banned. A second, expanded edition of Les Fleurs du Mal came out in 1861, and a third edition the year after his death in 1868. He also published an important set of prose poems, sometimes thought of as the first prose poems in France, inspired by the tales of Edgar Allen Poe. A respected art critic, Baudelaire has long been associated with music and inter-art relationships more generally. However, aside from his well-known connections with the work of Richard Wagner and a few well-known settings of his poetry such as L’Invitation au voyage by Henri Duparc in 1870, little is known of how widely his poetry has been set to music as song. How many song settings of Baudelaire’s poetry are there? What is a song setting? 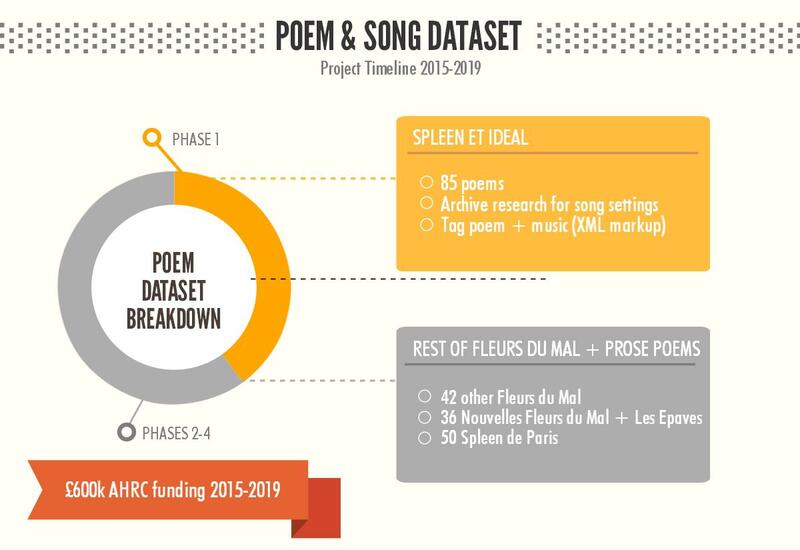 To bring together a full dataset of all the song settings of Baudelaire’s poetry into one, fully searchable digital resource, enriched by digital tools that will enable extensive search and visualisation of the core dataset of the different types and genres of song that Baudelaire’s poetry has inspired. To extract from that data a deeper understanding of what happens to a poetic text when it enters the realm of song, in order to contest the commonly-held assumptions that songwriters and composers necessarily ‘disrupt’ or ‘distort’ a poetic text when setting it to music. To tackle the belief that Baudelaire’s poetry is somehow ‘difficult’ or ‘highbrow’, seeking instead to demonstrate the widespread appeal of his poetry particularly in the form of popular song. To address the elitism that surrounds classical song as an art form, both in listening and performance contexts, finding new ways to open up this rich material to new audiences via fresh and engaging approaches to Baudelaire’s poetry. Calling all Composers, Songwriters, and Translators! 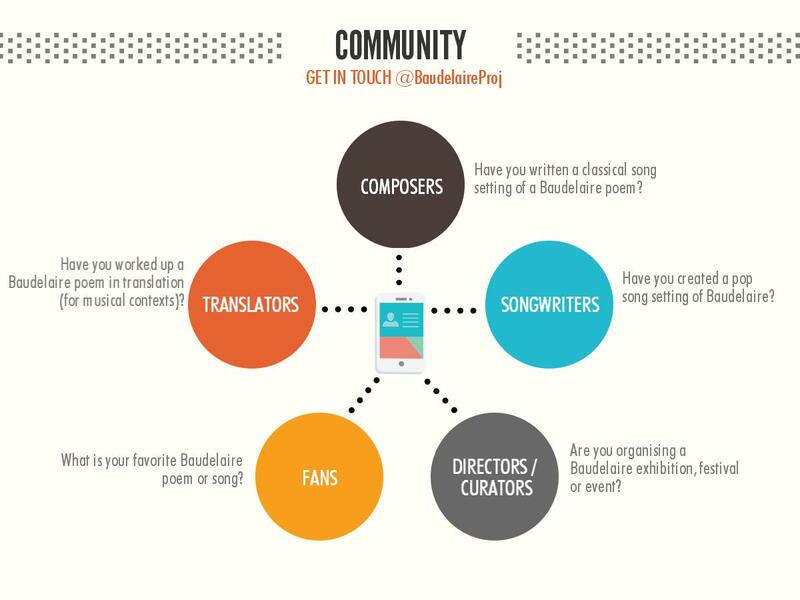 We would love to hear from you if you know of any Baudelaire settings – it might be your favourite song you’d like to share with us, or you might be a composer or songwriter who has put together a setting of Baudelaire, or you might be a translator who has worked up a Baudelaire poem as a ‘singable’ translation or who prepares translations for programme booklets. Are you a Baudelaire fan? Would you love to find out more about his poetry through music? We would love to hear from you if you have any questions or suggestions. We will be running lots of workshops and concerts which are open to the public of all ages in Birmingham, Sheffield, Oxford, London, Paris, and Toulouse, and all are welcome to attend. (Details will be announced via our News pages and Twitter feed). Get in touch with us either via email (h.abbott@bham.ac.uk) or Twitter @BaudelaireProj. We will always acknowledge your work and input, unless you request to remain anonymous.